Even though the TPU started off with a bang, the fireworks had started to fizzle out in Manchester as the Endurance Coaching Summit welcome party kicked off at the National Cycling Centre. This was a great chance to mingle with the coaches and TP staff on hand for the next 2 days plus another 100 delegates who turned up just for the ECS. We were also offered the chance to ride the Velodrome. The line-up over the next couple of days looked really great…and my expectations were confirmed after catching a few words with TP head honcho and co-founder Dirk Friel at the velodrome. The following morning Chrissy Wellington was providing the motivational breakfast keynote speech, as I rushed along the canal towards the ETIHAD stadium after a 12km morning run with another coach, Zak from ZTCride, Arizona who set a brisk pace, squeezing out the last few miles from my trainers (GT2000 already on order!). Chrissy, now Global Head of Health and Wellbeing for Park Run, highlighted the importance of the athlete-coach relationship and how dynamic and fraught with difficulties this could become, trying to manage injuries and prepare for races in the best way possible, every time. 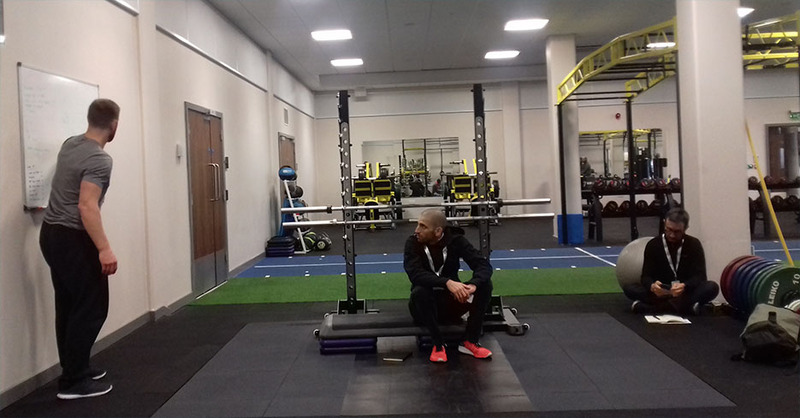 Resting on our laurels is easily done once a certain level is achieved, however that can be the opportunity to really mix-up and adjust training to take it even further, where possible. This set us nicely for the day ahead, and what was quite a spoilt choice of presentations, workshops and applied science breakouts. To make things less busy we were split between groups which could alternate between morning and afternoon sessions. First off the blue group (me) headed back to the Manchester institute of performance for two of the 5 applied breakout sessions. I choice strength conditioning for cyclists and overtraining syndrome (aka underperformance syndrome) which are two important aspects when delivering programmes. Mark Rippentoe delivered a succinct version of whats important for strength focus in the off-season and maintenance…boiling it down to just the necessary components. I recall seeing him at the ESP expo a couple of years ago, and largely agree with what he recommends….although I still base my periodisation programmes for strength off Chad Butts, as applied individually, which works really well. Next up was Dr. who covered the sports medicine side of over-training…but with a good practical angle. Ultimately over-training should be avoided at all costs, and with power files on hand, this makes it easier to flag issues well in advance. Things tend to get a little more complex with multi-sport athletes. The lunch session was dedicated to TP product updates, but I was late back from the institute after hanging around and harassing the speakers with more questions! The after-burn from the morning run meant I needed fuelling up instead. The afternoon presentations were much more tricky to choose between, so I split the first session equally between the psychology of goal setting, which I didn’t get much value from although the principles were sound, and data informed planning which is clearly an advanced strategy to dictate training programme prescription on actual, modelled event demands….and something that I currently factor into clients programmes, along with on the day pacing strategies to take maximal advantage of acquired performance improvements, using Cycling Power Lab, but imminently going to move across to Best Bike Split. The last presentations were harder to decided between, and I probably made the mistake of staying with the Heart Rate Variability talk from iThletes Simon Wegerif instead of attending Asker Jeukendrups periodisation of nutrition…something that I feel I understand quite well, but should always know more or confirm current schools of thought. Anyway, I recommend clients to sign-up to HRV4 Training which many prefer due to convenience and synchs with TP, and we understand its benefits and limitations…which leaves me to read-up on Askers work, in case there is anything new to the field. More homework! The panel discussion to close the day focused on high performance strategies for the time-crunched athlete…and the take away for me was that even though many figures and studies observe performance gains with elite athletes, it is important for coaches to understand their athlete in a way that gets returns on much less volume, and much more stress. Working training around life is a skill…as family and work are an important part of that. Monitoring data for key adaptations and reducing training down to the breakthrough sessions for compliance reasons should be a common approach, so athletes can get a sense of what is important and learn from the process. End of a long first day, and we were invited to the Tunnel Club for a drink….sparkling water for me! We also got to venture pitch side in the Stadium…just before pressing the button on an UberX to grab a well needed curry on Manchesters famous curry mile! Not feeling too delicate in the morning it was check out time, and the start of the final day! I grabbed another uber with heavy packs to carry so I wouldn’t miss any of Stephen Seilers fantastic delivery on the hierarchy of endurance training needs. Self-confessed pyramid style analogy to Maslows hierarchy of human self-actualisation, familiar with this I listened to Stephen talk through each layer with great interest. The bottom three layers being the most important to achieve for the rest of the pyramid to have benefit. Frequency and Volume of training with recovery in mind, High Intensity training an intervals for polarised training, this is touched upon in a future post on the myths of training and how not enough training distribution, which leads to Training Distribution…hitting all the energy pathways for the RIGHT duration, will allow you to get more exposure at those zones, meaning extreme efforts are supported by easier intensity. Also, how polarisation is considered for scheduling of sessions rather than training within a session, although on some longer ride workouts, I do prescribe this depending on phase and objectives, as staying out of a particular zone provides a quality workout and further stimulus. A quality start to the morning, and as I was star struck (Stephen had written a great white paper on interval training that I stumbled across, and basically confirmed my own applied systems) I managed another cheeky photo and signing, as yes I took that paper to meet its creator! On to our final two applied breakout sessions, and I chose well based on previous days recommendations, the biomechanics of running to avoid injury was a fascinating practical discussion on optimising running technique to maximise efficiency and minimise joint stress, something I hadn’t involved myself with too much. In fact, it’s instilled me to visit this great site more often with valuable and well written articles for athletes and coaches alike. 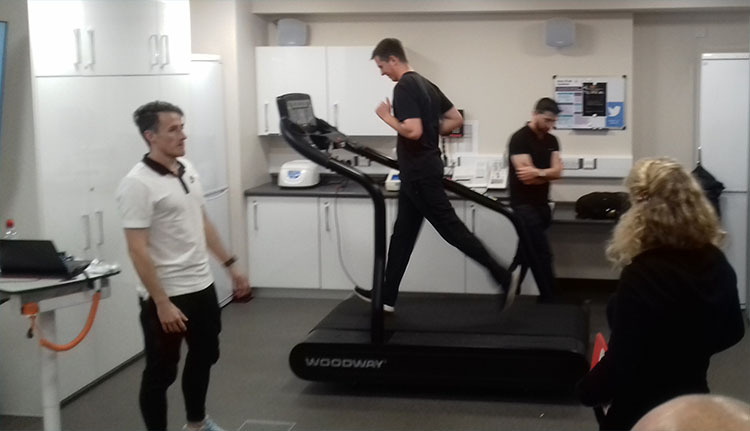 Next up was something even more distant from any practitioners radar and far too undervalued, but a topic that involves probably the most important component of an athletes physiology….breathing, or cardio-respiratory in essence. The mechanics of breathing were explained to us in context of actual functional problems seen in some high level athletes. Breathing patterns can be assessed to highlight a plethora of issues, diaphragmatic, inter-costal or heart related changes in inspiration and exhalation flows, at rest and under exercise stress. Keeping the trachea open to maximise airflow is the single most important obstruction to air intake, along with shape of airway. Breathing exercises can train acquired defects, to improve issues. Breathing exercises and flow limiters, something as simple as restricting air intake with your mouth shape are cheaper alternatives to improve breathing force, for recreational athletes. A live demo was provided during lunch, fascinating! So we moved back to the ETIHAD for the final afternoon, and a session I was looking forward to delivered by Dr. Andy Kirkland…Finding on Coach/ Athlete research, with a few factoids I can share with you here…97% of athletes think they would benefit from a coach, 13% of athletes believe they are not good enough for a coach, 90% of athletes who pay for a coach, value and are satisfied with the service they receive. The last bits before the panel discussion on endurance coaching, were orientated towards coaching as business, and the round tables with a variety of valuable discussions that we only were able to sit on two, although I walked around trying to get some valuable tidbits from the ones I thought worthwhile. The panel discussion was a head-to-head with some of the keynote speakers and experts, and one of the main takeaway was the rise of Artificial Intelligence (AI), and algorithms to automate the coaching process. Although quite alarming the lengths that some developers have gone to, and there are some innovative platforms, it was objectively underlined that the athlete-coach relationship couldn’t be replaced by machine learning on data or metrics, due to the multiple variables involved of getting form A-to-B on a non-linear path, littered with challenges which are typically unforeseen. Personalised prescription based on algorithms are great as I use it to calculate very effective and pesonalised interval sessions using the CPS-Gen App (more here), but ultimately automation plays a small part in the overall coaching process… although HRV data may be able to predict readiness to train or stress, a coach is more able to apply the context of training, and workout selection based on the individual, but also their tolerance to stress during a particularly hard work week, or following sickness…dynamic changes to programmes would me non-linear modelling of revisions on revisions to achieve a change of objective. This is something an expert mind can do with relative ease, whereas machine learning and neural networks are only just touching upon with any precision. Setting prospective sessions based on deviations from prescription is a higher order process….I’m sure it would take a considerable amount of time to upload the go-no-go decision process and translate to digital flow in entirety, but a good coaches real skill is applying a broad array of knowledge for diverse athletes, while maximising effect up to the event date. Perhaps one day it will happen, but that athlete will live an isolated existence unable to learn from a delicate process. Gear Fisher and Dirk Friel closed out the summit with a round-up that summarised the value TP has brought to athletes and coaches, along with future solutions and longeivity in the market, and out growing other sectors, that only more and more individual can leverage to improve their endurance training. The only question that remained, is where will the next Training Peaks Summit be?